There’s something irresistible to the roadtripper about any big thing that’s made to look like a much smaller thing, and put on display to allow people to see the thing. And apparently, there’s something about New Brunswickers that compel them to create such things. 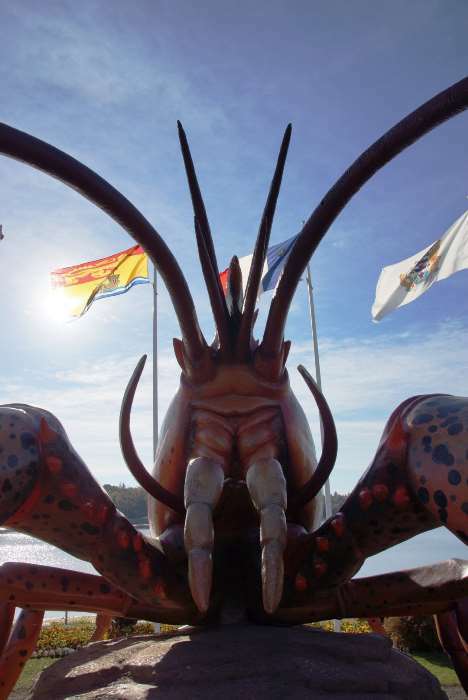 Within a day’s drive, you can see the World’s Largest Lobster and the World’s Largest Axe, and then tack-on the World’s Longest Covered Bridge, just for good measure. And since I was starting my day in Moncton, only about 27 kilometers from Shediac’s record-setting crustacean, it made sense to head directly there. 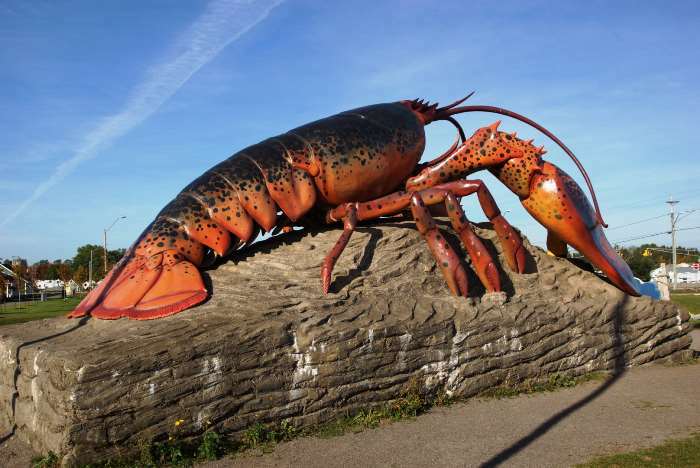 The World’s Largest Lobster is on display in downtown Shediac, New Brunswick, along Route 133, just before the bridge that crosses the Scoudouc River. If you’re arriving via Highway 11, take exit 1 and head into town, and you’ll see it soon enough. … and then climb directly up into it’s… um… what are those parts called? 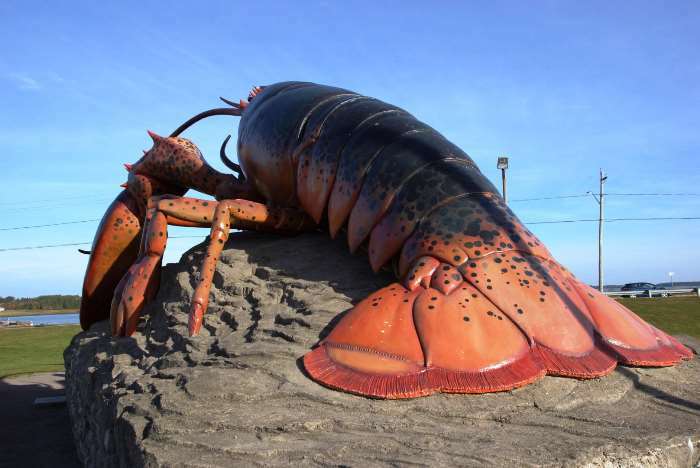 The giant lobster is 11 meters long and 5 meters tall (or about 36 feet by 16 feet). It was completed in 1990, after three years of work, at a cost of $170,000. The lobster itself weighs about 50 tons (not counting the pedestal). As you walk around the Rotary Park, which is home to the lobster, you’ll also see something that looks almost like Scrabble tiles. 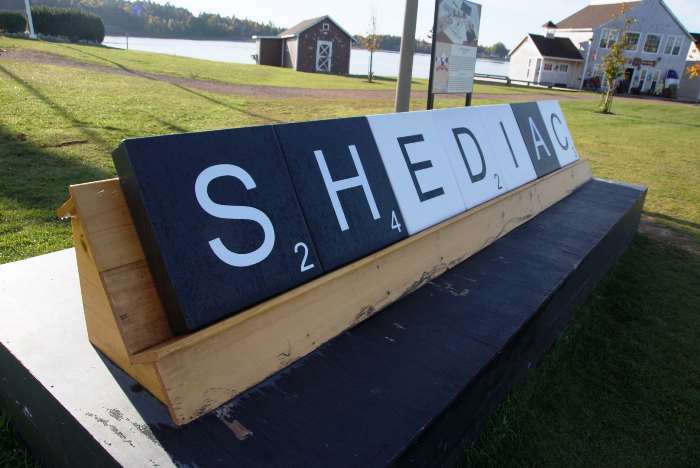 A nearby sign explains that the world’s first crossword-based board game was patented by Shediac mayor and attorney Edward MacDonald back in 1926 – a decade before Scrabble was developed. MacDonald’s version of the game was never marketed, though. It’s also quite handy that a few businesses are nearby, including a souvenir shop. Because the only thing as powerfully compelling as the desire to see things that are bigger than they should be, is to buy smaller replicas of bigger replicas of smaller things. It’s a giant lobster. Go see it.